amphetamine, MDMA-Ecstasy, MDEA-Eve, and MDA, and marijuana (carboxy-THC). might give them an acceptable “out” with their peers. collect a small hair sample. You simply send the hair sample for laboratory testing in the envelope provided. and anonymously over the phone. CODE NUMBER KEEPS ALL TESTING CONFIDENTIAL AND ANONYMOUS. taking drugs, but has been in contact with drug users? gold standard for forensic drug testing. collection and handling is clean and easy. 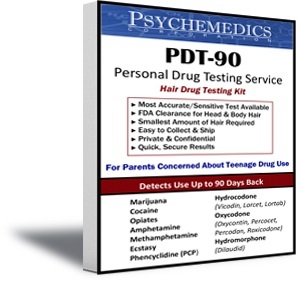 New - PDT- 90 Hair Drug Test Plus Prescription Drugs. Test for 12 drugs of abuse!